Payment Jack delivers the highest security through PCI certification and DES3 Secure with the convenience of a mobile phone and the ability to be used on over 400 phones. Process all major credit cards, including Mastercard®, Visa®, American Express®, and Discover® all on your smart phone. Payment Jack gives you the lowest swiped rates, while rigorously protecting your customers' personal data. No need to invest in credit card processing hardware. All the hardware you need is in your pocket already - your smart phone. We also include a web interface, so you can securely enter credit card information from your PC or Mac® and view extensive reports. Maximize your sales and add as many sub-lines as your business requires. With Payment Jack, you and your employees will be ready to accept credit cards no matter where or when. Compatible with Android® and iOS® phones, you can easily add as many lines to a single account. The Payment Jack portal gives you access to all activity on your sub-lines as well. Track your entire work force transactions, and improve your bottom line. 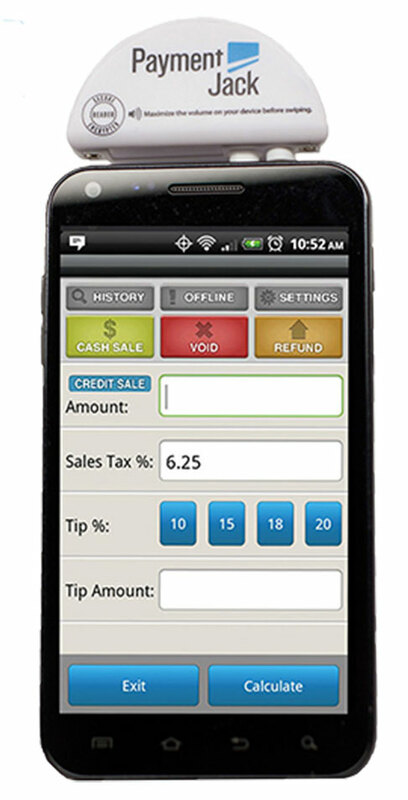 Ability to Swipe or key in transactions with real time authorizations. You can also log cash orders for reporting and receipts. You clients can receive emailed receipts, and you can build this information for future marketing and offers. Transaction history can be viewed online or on your phone.